A $20 smart light switch seems to good to be true. But Gosund has put together a basic solution for budget-conscious consumers if you can get past some glaring design flaws. When it comes to controlling lighting in my home, I’ve come to prefer smart light switches. The traditional smart plug is limited to lamps and smart bulbs can be tedious to control in multi-light fixtures. A smart switch on the other hand seamlessly fits into the home and can be controlled manually by those who don’t wish to tap into smart features. The problem has been that smart light switches are pricey. Popular options such as the Wemo Smart Light Switch ($40) or the Kasa Smart Light Switch ($35) can add up when replacing a house full of units. So when the Gosund Smart Light Switch started gaining buzz at just $20, I was intrigued. Could there really be an option that is half the price of its competitors? Would there be a noticeable difference? The Gosund Smart Light Switch has a fairly basic design. A large paddle switch sits in the middle and can be manually triggered by pressing down. An audible click can be heard along with some tactile feedback. This is touched off with a screwless plastic faceplate that would be great if it didn’t have the company name on the bottom. Trying to replace it with a standard decora plate didn’t work well. It’s just a bit too tight. So unless you want to jerry-rig a replacement to fit, you’re stuck with the plate that came with it. A small LED light sits on the top half of the rocker and will stay green when the switch is in the off position, or red when it is on (I feel like this should be the other way around). I’m a fan of having a light on my switch, but it’s simply too bright. It draws too much attention to the switch and might be an issue in bedrooms if you require absolute darkness. There is currently no way of turning off or dimming it in the settings. On the technical side, the Gosund KS602S Switch can apparently handle 15A according to the manufacturer. It is for single-pole use only and will not work in 3-way configurations. It does require a neutral wire. Installation is similar to a standard light switch with you connecting the live, load, and neutral wires. The size and wires in back would make it a tight fit in any multi-gang box. That along with the faceplate not fitting right means this should only be bought for 1-gang boxes. 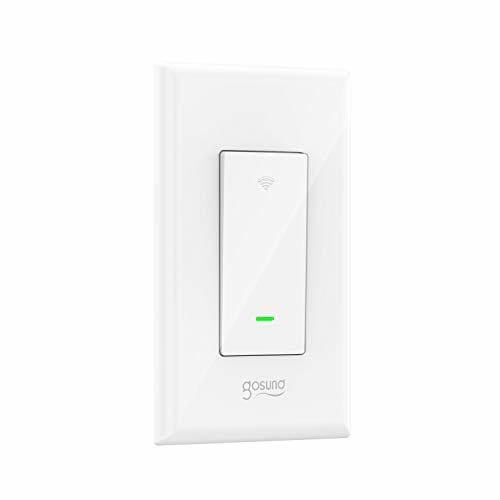 Gosund has built their light switch to connect directly to your home’s wireless network (2.4GHz only). There is no need to purchase additional bridges or hubs to use it. To connect, you need the Smart Life app which is available for free for Android and iOS (Apple) phone users. Two connection methods are offered: Ease and AP. The Easy method didn’t work for me but the AP mode connected on the first try. You are required to create an account using either your e-mail or phone. This is common in almost every smart home device. The Smart Life app is used by a number of smaller companies to control smart devices. You may already have it on your phone. It has a basic interface that lets you control turning on and off the switch from anywhere you’re connected to the internet. There is a scheduling feature you can use to have the lights turn on and off at specific times. Great if you are using them to control a porch light that you would like to turn on before coming home from work. This also can be handy if you’re out of town and want to give the impression that someone is home. If you have multiple devices being controlled in the app, you can have them work in tandem using their “Scenes” functionality. From a performance perspective, the Gosund Wi-Fi Light Switch worked well. The physical switch works as you’d expect and there is minimal lag when controlling through the app. For a product that came in at such a low price, I was pleasantly surprised by how well it maintained a connection. Over the course of a month it responded to every action I performed in the app and followed the preset schedule to a tee. It is worth noting that if your internet goes down, you can still control it manually like a traditional switch. Gosund offers voice controls through both Amazon Alexa and Google Assistant. This requires connecting your Smart Life app with the aforementioned services. Voice commands worked great with both services and you’re able to rename the switch to whatever you’d like it to control. For instance, I use this to control my porch light. I can say “Alexa, turn on porch light” and it will do so. All told, I was really impressed with the performance. Budget devices can often struggle when pairing with Alexa or Google Assistant. But not in this case. IFTTT support is also available through Smart Life. There are actually quite a few triggers and actions available. Unfortunately there is no support for Apple HomeKit or users of Nest, Samsung SmartThings, and Wink. Not terribly surprising considering the price. It should be noted that this light switch has gained popularity among advanced users who want to flash it with alternative firmware like Tasmota. The $20 price tag for the Gosund Smart Light Switch is the selling point. Its a solid choice for those on a tight budget. It has its limitation and should only be used in 1-gang units. But it performs the basics well if you can get over some of its design flaws. I tend to veer toward name brands when it comes to outfitting my home with new switches. It’s a considerable expense to replace 10 of them and requires a bit of time. So I’d rather go with someone I trust to continue updating their app, offer security patches, and provide new features over time. But I can see the lure at this price. Especially if you’re just looking to replace a couple switches. For that, I say go for it. But if this is expected to be a long-term investment in your home, I’d look toward brands that offer more features and have a track record for being reliable.